The RB-48, SweepPro, and Challenger 6 brooms are your choice for maneuverability, visibility, reliability and profitability for a variety of sweeping applications. From the safety and comfort of the all-season cab, the operator controls brush pressure, sweeping angle and speed with responsive joystick broom control and hydrostatic drive and steering. Rosco brooms also feature the innovative quick-change brush core system. The new Challenger 6 features a powerful Sweepster brush. 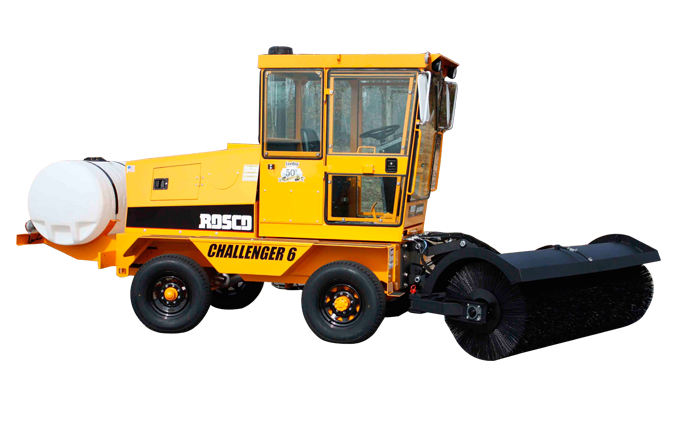 Rosco brooms suit contractor needs from construction site and landfill cleanup to heavy-duty road milling operation cleanup.